Word & Image | News and Features | Style Weekly - Richmond, VA local news, arts, and events. When he&apos;s not working at his full-time bank job, Paul Mackey volunteers 20 hours a week at Amtrak&apos;s Staples Mill and Ashland stations. Using a radio receiver and his own cell phone, Mackey announces approaching engines, records arrival and departure times and helps passengers board the right train. 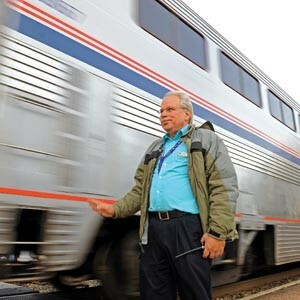 Mackey also is a hobby train watcher — literally, just watching trains — which he did at Staples Mill and Ashland before he began unofficially helping passengers. I love trains, so I was up [watching trains] in Ashland most weekends and I saw those people up there just needed some direction, so I started getting people on up there. Up at Ashland … people get on but there&apos;s nobody up there for Amtrak. It&apos;s an unmanned station, as they call it. But the train could be on either track, and that&apos;s what I mean when I said they need some direction. Nobody&apos;s ever missed it in the about 10 years I&apos;ve been up there. I just tell people to get ready, you know. But sometimes [at Staples Mill] there&apos;s two trains at one time … and people still want … to be assured this train&apos;s going to so-and-so. And then I write the times down when the train comes in and leaves. Because they have to record it up at the ticket window and sometimes they hear it and sometimes they don&apos;t. So if they don&apos;t I&apos;m kind of a backup so they can put it into the computer. My grandfather was a conductor in the 1920s on Seaboard Railroad. I didn&apos;t ever meet him because he died before I was born. But my grandmother, being a survivor, had a train pass, and she would take me on train rides when I was 4 and 5 years old. We&apos;d go down like to Henderson, N.C. Come right back like an hour later. I&apos;ve been out to Denver and Chicago and San Antonio and Tampa, all on the train. Just to be riding the train, I&apos;d go up to Montreal one day, and stay five hours and come back. On 9/11 I was … going to sightseeing in Philadelphia and I picked the wrong day that day. It was the most scary day of my life on the train. And the board says — all the time[s] — the whole board just went “cancel” straight down. And it just gave me chills. The Pentagon smoke was so thick it just poured on the train like the train was on fire. And we had people on the train that got on the train in New York that had ashes on their shoes. There&apos;s about a half a million train watchers in this country. It&apos;s almost … 100 percent males though. Ashland&apos;s considered one of the 10 best places in the country to watch trains. There&apos;s a … bed and breakfast right behind the Ashland station. And people come up, stay there, watch trains for a couple days, and then go home. They ask for a hotel room facing the tracks so even at 3 in the morning they can see trains coming by. So I&apos;m not the only one that, that&apos;s obsessed with trains.